Let's begin with RoboCop. 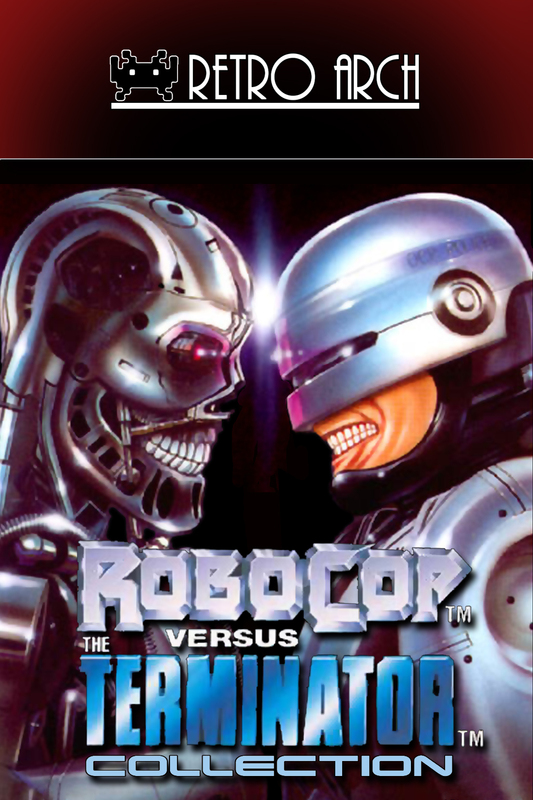 Out of all the licensed games in this collection, this distopian police officer fares the best. The arcade game, released in 1998 by Data East, lays the groundwork for the series. 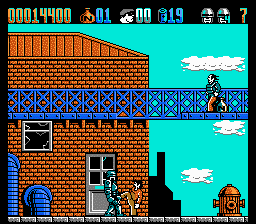 It's a side-scrolling run-n-gun game, but there's little running going here. 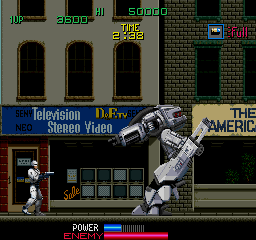 RoboCop saunters along punching or shooting the many foes as they rush towards him. The slow pace of our hero is reflected the design choices as well. Enemies are place in very specific place with different tactics needed to kill them unscathed, making for a more cerebral game than most other arcade games that rely on twitch based mechanics. 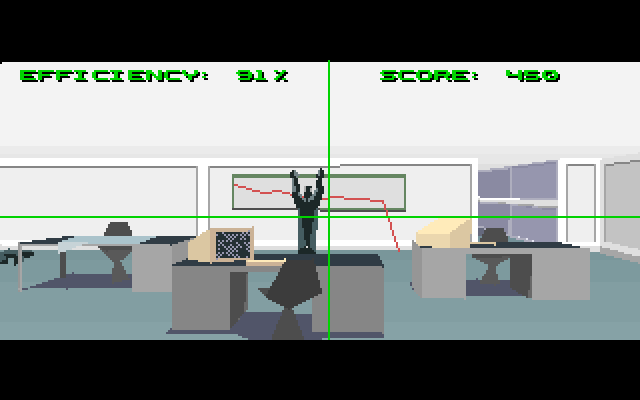 In between levels are mini-games that switches up the game-play. 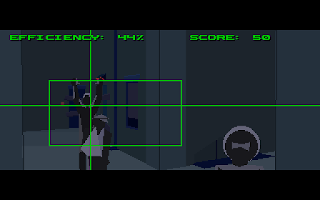 Most of the time they are a first-person shooting gallery, but you'll occasionally need to save an innocent who's been taken hostage by a gun-toting thug. 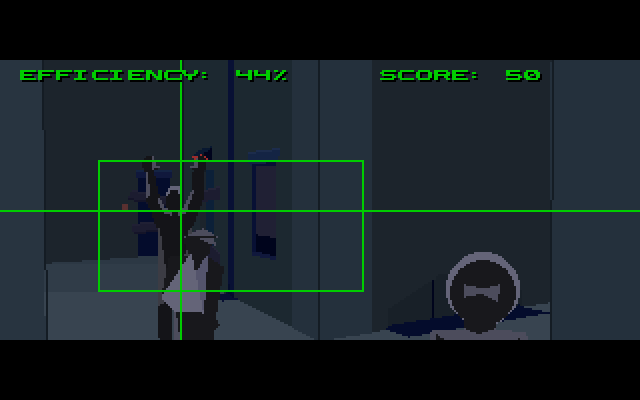 In keeping with the slower pace than 80s gamers were perhaps used to, there's also an identifit mini-game that's basically a matching puzzle, using facial feature to match an enemy face. They're not bad diversions and are a welcome and memorable change of pace. There were many arcade ports of this game, but the arcade stands up the best. I had fond memories of my Atari ST version, which is identical to the Amiga game, but I find the need for a single-button joystick hinders it somewhat. It's sequel was very similar with a few tweaks, including more platforming and better graphics. 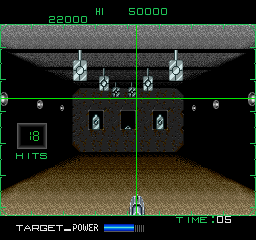 The shooting mini-games would be incorporated seamlessly during the levels as RoboCop focuses his aim towards the background. There were again many ports, but this time they each changed the game-play in order to get it running on the current tech. The arcade is the best of the lot, but the ports are serviceable. The third game, changed things up drastically. 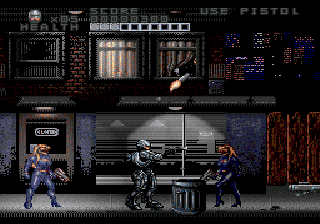 Released in 1992 by Ocean for home computers and based on the disappointing third movie, RoboCop 3 decided to take risks that the movie didn't - the entire game is in 3D! It wasn't just the kind of pseudo 3D that Wolfenstein or Doom became famous for, but a full polygonal environment. 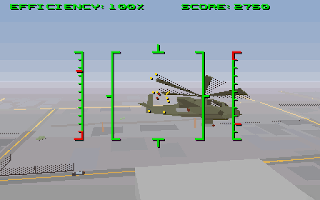 They didn't stop at simply being an FPS either, but also took the time to include driving, flying and fighting sections. Most of the time, you have multiple viewpoints too - an optional feature that more shooters would do well to adopt, even today. 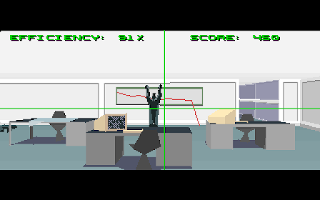 The looks take a minimalist approach that surprising still looks fairly impressive if only for its art style than its technical accomplishments. The colour palate is basically several shades of gray, and objects are re-used many times, but it all comes together cohesively. The biggest downfall would be the controls. The manual suggests using different input methods for each play-type including a mouse, keyboard and joystick. This means that if you wanted to play the whole game how the makers intended, you'd have to have all three at the ready. You can opt for just one method for each type, but they do play better with the suggested peripherals. 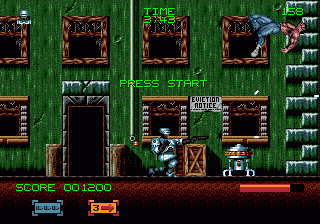 RoboCop 3 would also come to home consoles, again published by Ocean, but the innovation the more advanced machines enjoyed had to be stripped out. We're back to a slow-paced run-n-gun game with platforming elements much like what has come before. It's nothing special, but at least it's somewhat enjoyable. 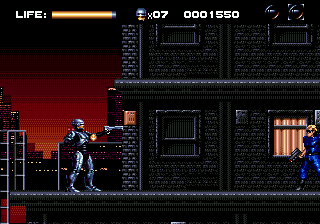 The SNES version was ported to the arcades using Nintendo's Super System along with Ocean's Addams Family platformer. While an interesting concept, the system was basically a Super Nintendo in a cabinet and little else. Even the controls did little to differentiate themselves looking almost exactly like a SNES joy-pad. The other ports were for the most part their own game. 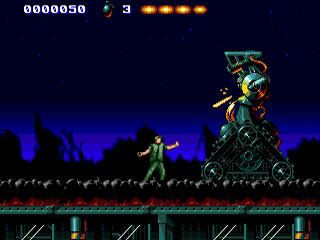 The 16-bit versions were the same, with impressive graphics but nothing to differentiate it game-play wise. 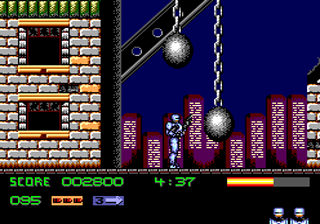 The 8-bit consoles and hand-helds had their own version which again relies on the tried and true platforming formula. 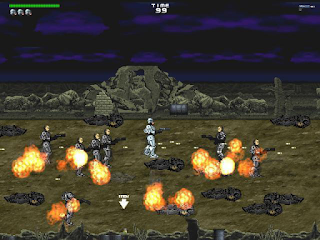 There was also an attempt at a revival in 2001 by French developer Titus Softare. 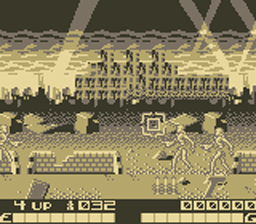 I've included their GameBoy Colour game which is a top-down shooter with confusing maze-like puzzle design. It initially seems like it could be a lot of fun, but after only a few minutes of actual game-play the flaws become apparent. The hit detection is sporadic which doesn't help when your weapon does so little damage. You do have power ups but they are not much more powerful and have such a limited amount of bullets to make them utterly pointless. The game gives you no direction of where you need to go or what you need to collect. The graphics even make it confusing as to what your looking at. This is best left as a curiosity. Getting away from RoboCop for a moment and onto The Terminator. Unfortunately the James Cameron's seminal series didn't translate so well into the interactive medium. Although Bethesda would later add to the mythos, bringing quality to the franchise after an ambitious yet flawed first attempt, those based directly on the movies didn't have the imagination or talent behind them. After Bethesda's open world 3D adventure, we received a spate of games based on the biggest movie of 1991 - Terminator 2: Judgement Day. The home versions were universally terrible. 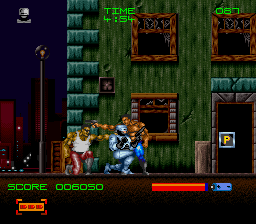 For consoles, we had a variety of broken beat-em-ups with questionable hit detection, confusing progression and laughable animations. 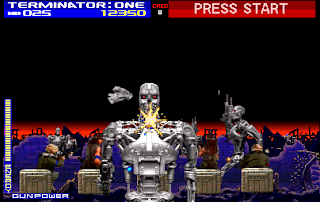 If you want a chuckle, see the T-800 jump in the 16-bit versions. What's worse is that there's little need to actually use this function as combat is reduced to punching and kneeing. 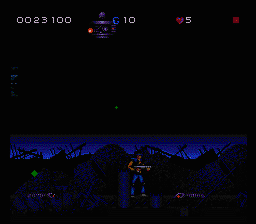 You'll later find a gun, apparently in the first level, but I gave up finding it after a solid 20 minutes of wondering aimlessly. The home computer version were even worse, if you can believe it. Here, they decided upon a string of lackluster mini-games that reference direct scenes from the movie. All of them are completely broken, being nigh on impossible figure out and play. 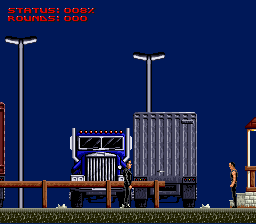 I got through the first screen - a shoot out between the T-800 and T-1000 - by hammering the space bar and blindly hoping something would happen. Sheer luck got me through, only to see a confusing timed puzzle to fix a robot hand. Stay away from these. The light-gun arcade game was much better. 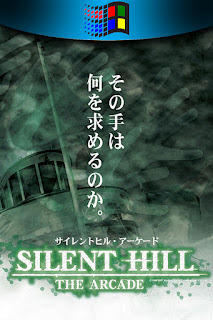 It was ported almost verbatim to every system available and was even considered a successful translation on some systems. 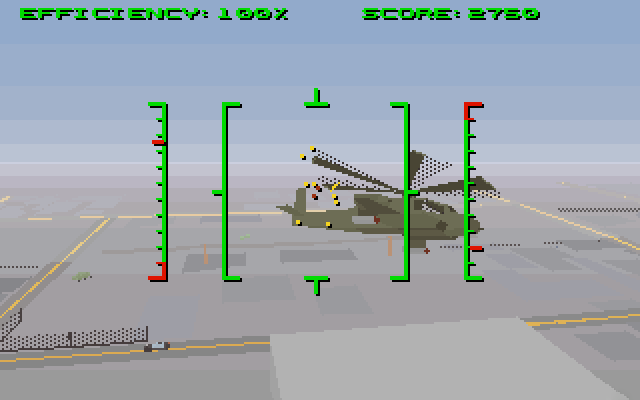 To get the authentic experience though, you'll want to play the arcade version. In all honestly, I wasn't too impressed with the game. I found it repetitive with little variety and too difficult to motivate me want to keep going. The difficulty didn't seem fair either, bombarding you with a mass load of enemies and bullets that you cannot possible overcome. Unless you have more coins in your pocket. Like the film, this was the number one arcade game for the time so it must have it's fans. If you want a really good Terminator game, your best bet in this compilation is to focus on those based on the first movie. 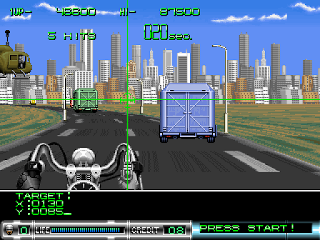 Released first on SEGA's consoles in 1992, with Nintendo and the Mega CD getting their unique versions a year later, they were all very competent platform shooters. 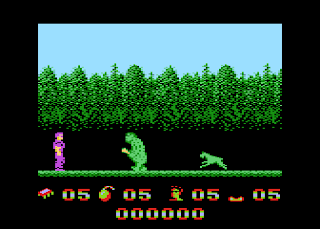 There are essentially four different games all sharing the same theme and similar mechanics. If I were to choose only one, the Mega CD version wins. 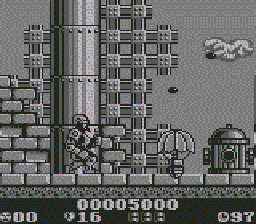 The controls are tighter here with more imaginative level designs. There's also an unofficial Atari 800 game from Poland where controlled the T-800 (who was the bad guy, remember) fighting off badly realised dinosaurs. 'Nuff said. 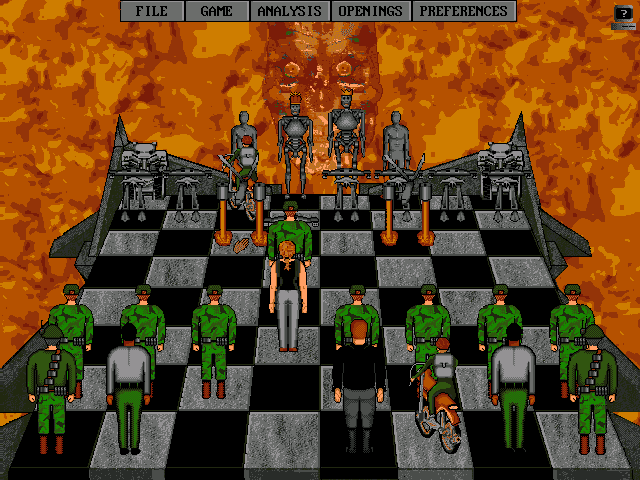 When you think of The Terminator, the first thing that always comes to mind is a slow-moving game of chess. At least that's what Capstone thought in 1993. It replaces all of the chess pieces with memorable characters from the movies such as that grunt dressed in green and two versions of John Connor (both as an adult and as an annoying kid on a motorcycle). You can't say much more about chess but at least they attempted an element of excitement here by making the fight animated. Badly animated, mind, but at least they tried. 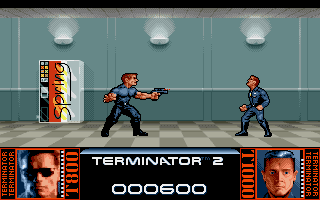 The last game in the Terminator franchise on the collection is Atari's GameBoy Advance game based on the third movie. It's a laudable attempt at trying an isometric action game, but the annoying controls and overall unpolished feel mars what could've been an OK game. A missed opportunity. The early nineties saw a comic book merge the two franchises. The plot was convoluted as all hell, but that didn't stop it from being awesome, exploding geek minds just like when Aliens crossed paths with the Predator. 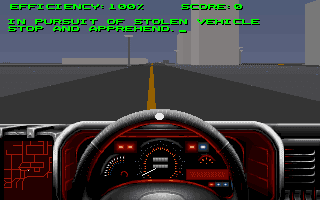 Naturally a video-game adaptation would be made and 1993 was when we were able to play it. 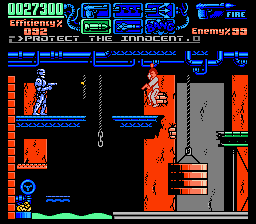 You again play as RoboCop, with The Terminator and his SkyNET machines being the big bad. These games are actually a lot of fun merging the two styles perfectly. A lot more effort has been put into these games and it shows. That's not all! 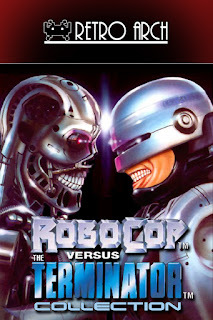 In 2005, independent developer Park Productions came up with a trio of free RoboCop games and ended up creating some of the best games on the collection. 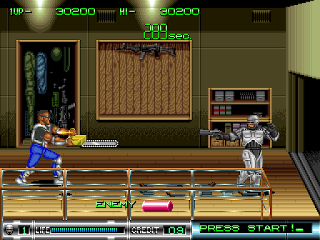 Entitled RocoCop 2D, they are side-scrolling beat-em-ups with a heavy focus on gun-play. 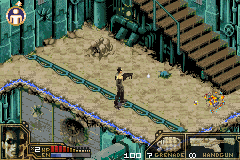 The third game even adds depth of play by introducing an isometric viewpoint. The effort gone into these games is astounding. While not all of these games could be considered classic, they are a throwback to an era of licensed gaming that is mostly forgotten about. 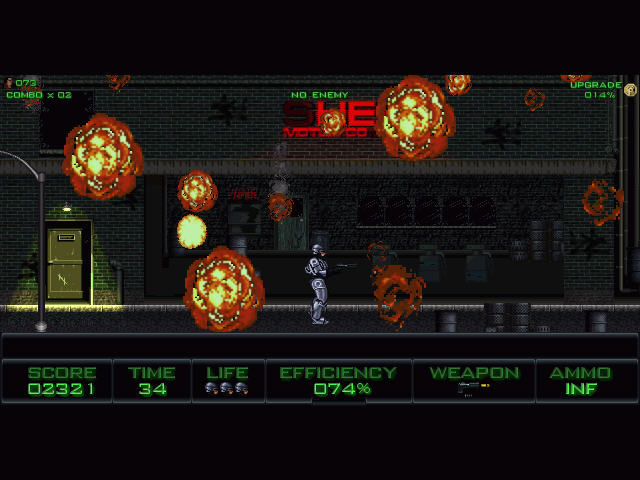 While most of the RoboCop games have stood the test of time fairly well, The Terminator's efforts only go to prove why such games have such a bad reputation. I still found a lot of them curious and even - dare I say it - fun, but I doubt I'll relive many of them any time soon. To download the game, follow the link below. 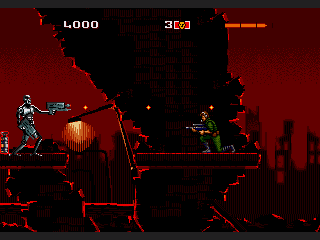 This custom installer exclusive to The Collection Chamber uses DOSBox, MAME, Atari800Win, FS-UAE and Retroarch with the NEStopia, SNES9X_Next, TGBDual, VBA_Next, Picodrive and Genesis Plus GX cores to emulate the games on modern PCs. XBox 360 controllers supported for the console games. Manuals for some games included in the Manuals folder. Tested on Windows 7. This collection mainly focused on early PC and console games, otherwise it would get pretty large. There are a few more games that I could add including the (pretty bad) GameCube RoboCop game which I believe is different from the PC one. 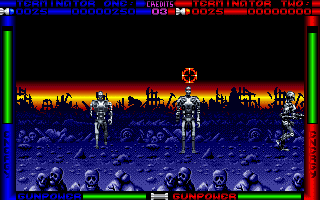 I did get a Terminator 3 FPS for PC working at the time but it was mainly designed to be an online shooter making it a bit pointless now. I've not tested it on Windows 10 yet but I don't remember liking it very much. UPDATES - JULY 2015 - DISCWORLD NOIR!